You'll be £19.99 closer to your next £10.00 credit when you purchase German Soldiers in the Great War. What's this? Order within the next 6 hours, 10 minutes to get your order processed the next working day! This vivid selection of first-hand accounts and other wartime documents sheds new light on the experiences of German frontline soldiers during the First World War. It reveals in authentic detail the perceptions and emotions of ordinary soldiers that have been covered up by the smokescreen of official wartime propaganda with its talk of 'heroism' and 'patriotic sacrifice'. Over 200 mostly archival documents are featured in the selection, including wartime letters, military despatches and orders, extracts from diaries, newspaper articles and booklets, medical reports and photographs. This fascinating primary source material provides the first comprehensive insight into the German frontline experiences of the Great War published in English. Bernd Ulrich is a freelance historian and journalist in Berlin, who works for newspapers and magazines, publishing houses, academic journals and museums (www.berndulrich.com). He is a specialist on the First World War and has written a number of books and articles on this topic. Most recently he was the curator of the exhibition. Benjamin Ziemann is reader in modern history at the University of Sheffield. His research has concentrated on German social, cultural and political history during the nineteenth and twentieth centuries, and he has made a special study of the First World War. In addition to his many articles in academic journals and magazines, his publications include Sozialgeschichte der Religion. I would recommend this book in that it exposes a part of the conflict that is often overlooked or that receives minimal exposure by many authors until they discuss the very end of the conflict and the collapse of the German army. By presenting the materials in the manner outlined in this book the editors have shown that much of the issues facing the German Army of 1918 had been present and growing in size and importance ever since the war began. The book is an important addition to our repertoire of English language translations of German primary source material from the First World War. The two greatest contributions of the book are the testimonies of non-elites and the utilization of soldiers' own words to exhibit the wide array of outlooks and reactions to wartime service... The sources by themselves demonstrate the impossibility of speaking of a single German ‘war experience’. In the end, this book will prove of interest to scholars and non-specialist readers alike and would complement any number of upper-level undergraduate courses related to German or modern military history. This is a serious piece of academic work, supported by a well thought out framework, which is explained clearly in the introduction. The extracts themselves will be of value to anyone with an interest in the German experiences in the trenches, while the supporting text gives the book a great deal of value to serious students of the subject. This amazing work only narrowly missed out on being the Editor's Choice this month. 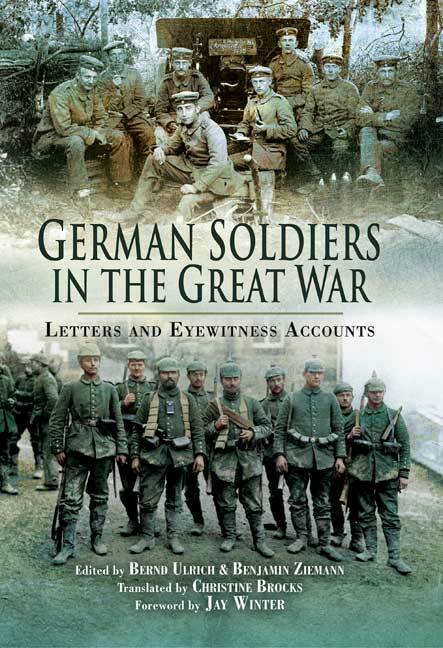 Using archive materials as well as personal letters, diaries, extracts from the newspapers and various official reports, this book provides a fresh look at the war from the perspective of the German Soldier and his experiences in the trenches, charting the rise of disobedience which culminated in a 'military strike' in the autumn of 1918. The authors have chosen extracts which bring vividly to life the personal thoughts and feelings of those who served the Kaiser and his Generals. This is a selection of quotes from German soldiers, mainly from the Western Front, drawing on unpublished letters and memoirs, press and other articles, and held together with commentary and contextual explanation from the editors. I have rather mixed reactions to it. On one hand, I always enjoy first-hand accounts of the war and it is refreshing to read accounts from the other side. "German soldiers in the Great War" goes a long way to confirming what the soldiers all knew: the experience of the front line soldier was similar no matter which side you were on. Life was hard, tedious, shocking at times, soul-destroying. It also had moments of humour and great comradeship. There are some very interesting aspects specific to the German armies: surprising references to brutal treatment of early-war volunteers by regular NCOs and officers; rivalries between Prussians and Bavarians; the effects of hardships at home; the confusions and tensions of 1918; and greater politicisation of the front line soldier than seems to have been the case in the BEF. (The latter point may be down to the editor's selection of material). Yet somehow the book left me felling rather flat. The mix of the book includes rather a lot of official reports, decrees, press articles and other arms-length observations, which I found of value but are hardly eyewitness accounts. It is inevitable that such a work can only include a selection of the material that exists in archives and private collections, and contemporary material was constrained by censorship, but I found the soldier too often taking a back seat to the commentator and officialdom. There's rather too much, for me, of introducing quotes by explaining that the man was a Reichstag Deputy, a member of a political movement, a trade unionist and not enough of whether he was a gunner, an infantryman, a base wallah or a transport driver. If you are interested in the German soldier's specific experience, I would rate any of Jack Sheldon's works of battle analysis ahead of "German soldiers in the Great War".